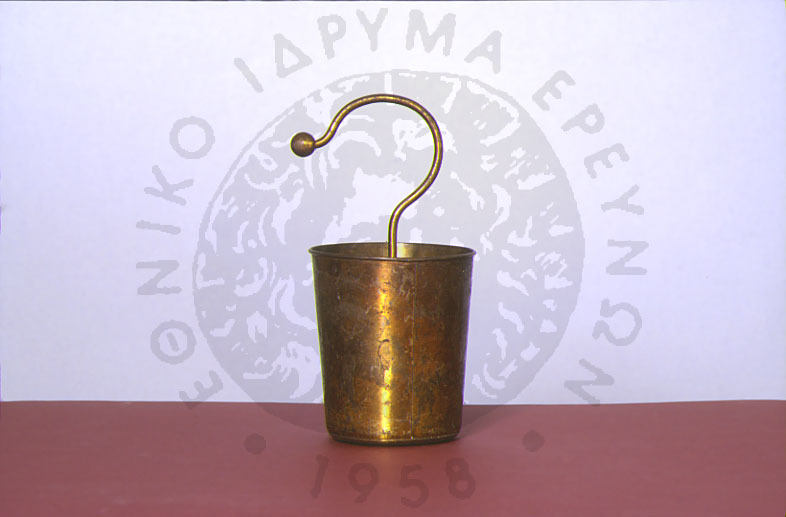 Used for Physics education at the First Gymnasium of Athens, Plaka. A Leyden jar is a condenser that consists of two metal-foil coatings on the inside and outside of a stoppered glass jar. A bronze rod passes through the stopper and is connected to the foil coating on the inside of the jar. The free end of the rod forms a small sphere. A Leyden jar is used to store and move electrical charge. The glass between the two layers of metal serves as the dielectric of the capacitor. When the free end of the bronze rod comes into contact with and electrical device the jar stores electrical charge. A discharge of the capacitor occurs when the rod is connected to the coating on the outside by a conductor. The first Leyden jars were invented around 1746 and were simple glass jars fitted with water and a piece of wire with one end dipped in the water.